The following links are to gpx files of the Fat Dog 120 race course. I found them super helpful last year using my Sunnto Ambit2 when I wanted to double check that I was on the right course, especially up by Trapper Lake. I believe they are fairly accurate, though the total distance may be less than 120miles. They were recorded by Ed Sargisson a few years ago, so my greatest thanks to him! The course is split into 6 legs, but I also have it where it's split into 9 legs (for the relay) so let me know if you want me to upload those too. For those using Movescount, you can search/see the Fat Dog course segments in the Routes section. Below I've also included a profile with approximate locations of the aid stations, and where pacers are allowed to join. The pacer spots are also places that crew could have access in the latter part of the race - keep in mind Heather aid is 5km from the parking lot. 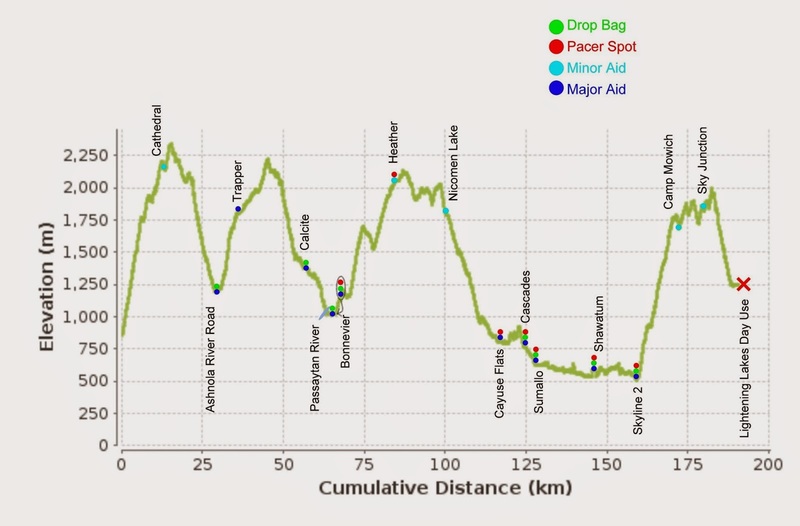 FatDog120 profile with aid stations (approximate locations). *Bonnevier Aid is just before the first uphill section as indicated by the arrow. Thank you so much for these GPX files! Due to weather, they are eliminating Legs 1 & 2 of the race this year and adding Frosty Mountain as a leg after Skyline to Lightening Lakes. For the runners this year, would you be willing to post Legs 3-6 as a single GPX file? Or if you have the GPX coordinates for the Frosty loop, Legs 3-7? Thank you so much! actually it's due to a big forest fire (Placer mountain) that has closed the Ashnola access road used to access the start, Cathedral, Ashnola and Trapper aid station. That's great, thanks for these files! I created kml out of the gpx files, but prior to the course change. Nice to be able to view this last leg in GE! The last big hill climbed before FatDog!